Grace your space with this stunning comforter set, which showcases embroidered damask motifs and pleated accents on heathered fabric for gorgeous blend of texture and pattern. Made of sumptuously soft polyester fabric, the set includes coordinating shams, Euro shams, and decorative pillows for a complete bed transformation that will instantly upgrade your decor. This 7 pc. comforter set looks great. You can add pillows as the picture shows to pull in other colors of your room. It is lightweight but still warm! Love that! I will just stick in the dryer to take out the shipping wrinkles. 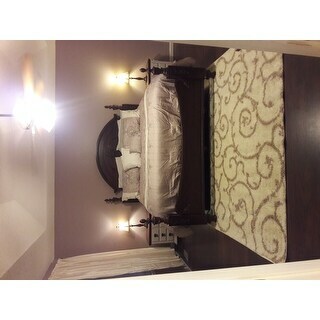 Looks great with our brown carpet and brown bedskirt. 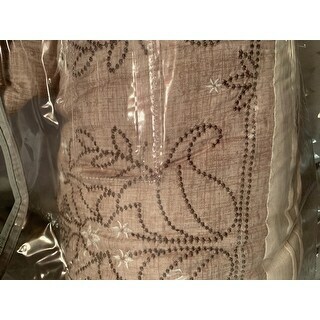 Now to find the square pillows for the Euro shams. Also like the fact that it is machine washable. The polyester material should wash up nice. I will check back after washing. The only thing I worry about is the polyester filling shifting and getting lumpy. I received item when expected. It's a great set. 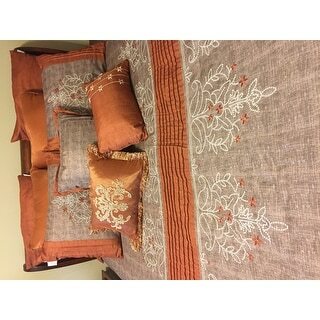 For a king size set just wish it had three euro shams instead of two for larger beds. I love it it so soft and perfect for winter nights. The colors are gorgeous and really compliments my bedroom. I like the colors of this comforter set. But it is a little short on the sides. Also, I do not like the square pillow cases that comes with the set. None of my pillows fit right in them. Since it is a king size comforter set, the pillowcases should fit king size pillows. The bedding is a fair quality. One of the pillows is not sewn, but I can repair. The weight of the comforter is lighter than I like. It's prettier than the picture. I added 3 pillows that I used with my old comforter. Works perfect for our master. Pretty enough for me to be girly and still manly enough for my husband. I love this set for my guest room. The price and quality is great. The color was a tad darker; however, once it was all laid out it came together beautifully. I only wish it came with curtains. Overall a great find! This comforter set is exactly as pictured. The colors and design are very accurate. I would definitely recommend this product. It is not too heavy, it is a very nice light weight comforter!! My fiancé loves it! It’s absolutely fabulous and I’m so happy with it! It’s super soft and just the perfect weight not super heavy. My dog loves it too. 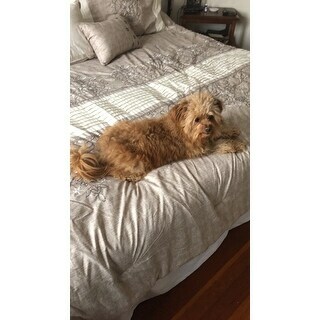 The comforter is warm and nice looking. Ok...not great. The white backing on the decorative pillowcases is distracting. Dislike the quality. Not as soft as I would like. The queen was short on the side and did not cover the mattress on the sides. Should had been a bit longer to look attractive. Bought this for our extra bedroom. It looks very nice. The length is a little short so that would be the only negative but overall very nice. 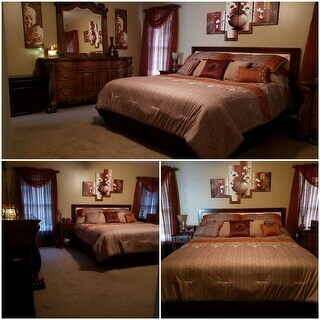 I love the color, the comforter is too long and the width is not enough to come over the sides of the mattress. Color doesn’t match the match. I ordered tan but got brown. It is so beautiful more so when I got it today. I am proud that I purchased this comfort set. I would but another one if I needed it. I love the material and the workmanship. Very nice quality, looks exactly like picture. Goes great with the nuLoom fug I just purchased from Overstock. This comforter is not comfortable. It's stiff in spots and not soft. However it does look pretty. "Does the queen size go off the sides of the bed like shown in the photo?" "Is this comforter too warm? We have a tempurpedic bed and most traditional comforters have us sweating in the summertime. I'm on the hunt for a lightweight (but not TOO lightweight) comforter! Most throws or lightweight quilts have us shivering so I'm hoping for a happy medium. Thanks in advance!!" "What color is the blue in this? Is it like a denim blue?" I don't know about the Blue, i got the Burnt Orange and it's true to color as shown in the picture. "Does the spice color come in a Queen as well or is that only the king?" Currently, the spice is not available in the Queen size option. "Is the spice color brown and a burnt orange color? I want to be sure I am ordering the right color." Yes the burnt orange is spicy orange. Very pretty choice. "Is there sheets available for purchase for the spice color? " "What are the dimensions of the queen comforter ?" The queen comforter is 90 X 90.